Report by Alice Stanley, Year 12. 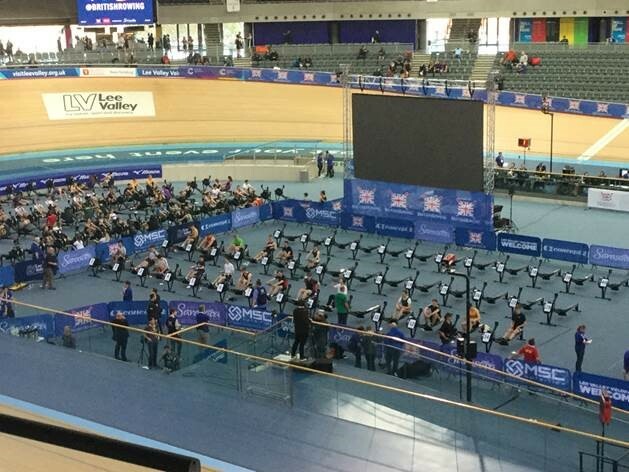 We arrived at the Lee Valley Velodrome with a huge amount of enthusiasm for the day ahead. The first race Berkhamsted participated in was the Year 11 boys 6 minute race, with so many entries, the standard was high. We did not disappoint, with Dan Norris finishing in 31st place with a solid 1631m, Louis Green in 37th place with 1596m and Adam Boustred in 50th place with1387m. Morgan Alexander then raced in the Sixth Form boys 2000m race, along with Alice Stanley in the Sixth Form girls 2000m race in the next group along. Both Alice and Morgan gave it their absolute best, with Morgan improving dramatically on his performance from last year. The Year 11 500m race was extremely close, with Dan, Adam and Louis finishing within a short margin of each other. Louis pulled out all the stops, finishing in 1 minute 37 seconds, 2 seconds after the leader of the pack, with both Dan and Adam finishing closely after, with 1 minute 42 seconds and 1 minute 55 seconds respectively. The Sixth Form boys 500m race was another fast paced few minutes, with Morgan finishing in 1.47mins. Alice finished off the day with the last race for Berkhamsted in the 500m sixth form girls race, racing under her expected rate and completing the race in 1.52.5 minutes; a tremendous effort. Well done to the Berkhamsted team for being so determined and supportive of each other throughout the day, when both spectating and competing.